A. Well, I coined them as a sort of shorthand. A philosopher friend of mine said that there was a very clear way to describe these groups, one of them is a Schumpeterian–technophiliac–meliorist (laughs). But that didn’t seem all that clear to me, so I call them wizards, as in techno-wizards. Wizards basically believe that science and technology, properly applied, can let us produce our way out of our dilemmas. Prophets believe that there are natural limits, and we transgress these limits at our peril. Q. The wizard you chose to focus on was the agronomist Norman Borlaug. Why him? Q. 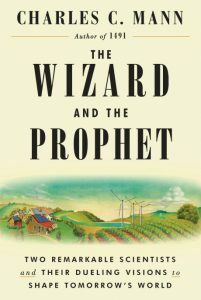 Your prophet is the ecologist William Vogt, and you make a good case that he really cued up the modern environmental movement. Q. OK, next problem: How do we feed ourselves? It’s not crazy if you accept the way industrial agriculture is the way to go. I talk in the book about the C4 rice initiative at the International Rice Research Institute in the Philippines, which aims to make photosynthesis work better in rice. The reason rice crops need most of their fertilizer is to make this enzyme called rubisco that plays a key role in photosynthesis. So the idea is if you had more efficient photosynthesis you would have less rubisco, less nitrogen, less fertilizer, less pollution, and a bigger harvest, and everybody would be a winner. And that’s the wizard theme. So the other way to do it, the prophet’s way, is to use those natural carbon-eating devices known as trees. There are large blank spots on the map that don’t have much vegetation — the Sahara, the Australian outback — but they were covered with vegetation in the past. You could reforest them with drought-tolerant trees, proceeding from the edges with desalination plants along the coasts providing water. You could take a significant bite out of the carbon load in the air. A lot of reforestation has been done in the last 20 years in the Sahel, just beyond the Sahara where there’s more rain, and it looks pretty nice. if you’re provisioning roman troops (cannon fodder), then dense, empty calories are the ticket. if you’re feeding schoolkids, then eggs, fish, beef and vegetables will provide the best results. We have the technology to produce enormous amounts of food and yet throw half of it away. We don’t need new tech to feed more people – we need to stop being so wasteful. Actually long term the population is already set to decline. Note that the big issue here is the reduction of total fertility (children per woman over a life time) has declined from 5 in 1950 world wide to 2.5 today. The population growth rate has fallen from 2 % in 1950 to about 1.2% today and is predicted to fall to near zero in 2099. https://ourworldindata.org/future-population-growth and for the total fertility rate https://ourworldindata.org/fertility-rate. The essential element is to look at population on a world wide basis. The site also shows that the time it takes for total fertility to fall from 6 to 3 has fallen from 95 years in the UK (1815-1910) to 10 years in Iran (1986 to 1996). Partly this is because a much higher percentage of children reach adulthood than 120 years ago. Apparently the main issue is to give women more education so they realize there are other things to do with their life than have children. (Then add free birth control with long lasting IUD devices) . My calculations, if i included the manure from the 3 feedlots, indicated that all the city electric(wells, pumps, streetlights, etc) and about half of the electrical of the poor side of town, could be met with these efforts. Given the world’s current population and the incredible amounts of waste in the developed world (not to mention so many obese people eating all the pies), there is a ready case for arguing that 10 billion would be easy to feed. But 10 billion well-fed leads to 15 billion in a short time. And so on. Look no further than the number of plants scrapped or projects abandoned (globally and in the US) and the true long terms costs being realized (most notably in the US, Japan, and France). If nuclear is such a no brainer why are all the big players running for the exits (Germany, consistently on point WRT energy policy, comes to mind). If nuclear’s “true cost” is actually the 3.5 cents/kWh provided by Forbes (https://www.forbes.com/sites/jamesconca/2012/06/15/the-naked-cost-of-energy-stripping-away-financing-and-subsidies/#a4af6385b880) then every single utility would be building nuclear plants, yet we see the opposite, and high costs are cited as the cause. Seems like hard intellectual dissonance to me. The production of liquid fuel is a reasonable example of this. Alcohol can be produced from a wide variety of feedstocks from corn and wheat to prickly pear cactus to comfrey. In just about any microclimate there are crops that can be sustainably grown for both food and fuel. But no single crop is suitable to all environments. And resource is not being allocated toward the creation of distributed, small-scale (potentially cooperative) enterprises that could more sustainably manage and produce this energy. So ‘everywhere’ gets scraped at scale for corn, cane, beef, and fracked gas because it’s easily done and it’s the schema that’s been in use. Good people argue about food versus fuel and the environment keeps taking it on the chin.